Why search for great stocks when I can buy ultra ETF’s? I spend so much time trying to find the right growth stock that will outperform the market. Now that we have the extreme ultra (3x) ETF’s it may be preferable to trade them. An ultra ETF is a basket of leveraged stocks or futures that attempts to outperform the relevant index. Since I like to trade tech stocks, I focus on the NASDAQ 100 index, which escaped some of the carnage last year because it contains no financial stocks. I could simply buy the QQQQ ETF when I think the market is in an up-trend. 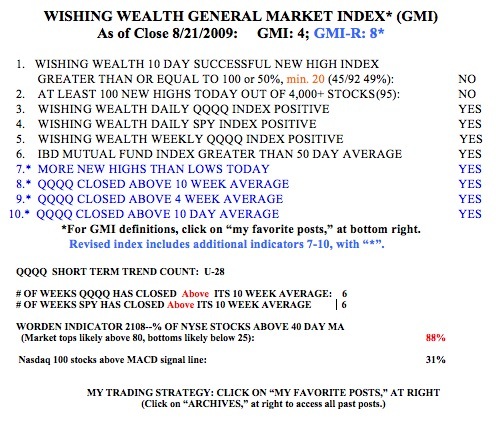 In this way, I do not have to pick individual stocks but am invested in the 100 stocks in the NASDAQ 100 index. Lately, stocks tend to explode or implode when earnings are announced. Because the QQQQ represents 100 stocks, there is less impact from individual earnings announcements. If I want to place a leveraged bet on the QQQQ I can even trade options on that ETF. Enter the Ultra QQQQ ETF, QLD which attempts to double (2X) the bullish performance of the QQQQ. While there is no 3X ETF for the QQQQ, there is a bullish tech 3X tech ETF, TYH. (There are also analogous bearish ETF’s for those betting on a decline in these stocks, which I will not discuss today.) Keep in mind that since these ultra ETF’s are leveraged securities, they can move more quickly in both directions–up or down. So, if I am betting on an up-trend I could buy any one of these ETF’s to make money as tech stocks go up. The table below compares how one would have done by buying each of these ETF’s during the rally that began after 7/14 through 8/21. Meanwhile the trend remains up, according to my indicators. The GMI is at 4 and could turn 6 with an up day on Monday. It is curious to me that rather than enjoying the party, people prefer to worry about how long it will last. I will ride this trend until it ends. I assume you have read all the articles on the ultras, showing that the daily resets negatively impact the expected multiple returns if held for long periods of time!? I have seen those reports, but every time I run an analysis like the one above, I find that the ultra’s always outperform the standard ETF. I want to point out that in a trendless market, The 3x ETFs can lose 20% in a week for either bull or bear ETFs. The 2x can lose 20% in less than three weeks in a pig market as well. Time decay. i continue to read your blog regularly. thank you for all your help over the last year; i attribute much of my success to you. what is your exit strategy when using ultra-leveraged ETFs? it seems to me that regular or trailing stop loss orders aren’t ideal for this type of trading.